For instance, many household cordless products we use every day are powered by rechargeable batteries. These batteries are not only recyclable but contain materials that are potentially harmful to the environment if thrown in the trash. 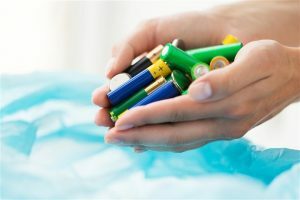 In fact, at least 20 percent of people are holding on to their used batteries because they know they shouldn’t be tossed out — but they don’t know where to dispose of them. Participate in a local community recycling event — or create your own.